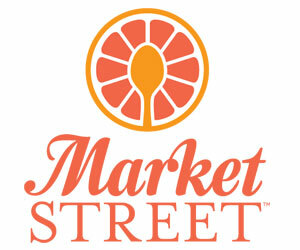 I have been compensated by Market Street for writing this post. All statements and opinions are my own. One of the best things about summer is the beautiful, sweet, fresh fruit. There are so many ways to love it: eat it right out of your hand, bake it up in a cobbler, swirl it into a frosty smoothie. One of my favorite ways to enjoy fresh fruit is to serve it with this easy dip. Just two ingredients, a couple of minutes, and you're on your way to cool and creamy fruit dip deliciousness. Everyone loves it. 1. Place the cream cheese in a large mixing bowl and mix with an electric hand mixer on low until smooth. 2. Scoop the marshmallow cream into the cream cheese and mix on low until smooth and well combined. Makes about 2 cups. Refrigerate until needed. Refrigerate leftovers. 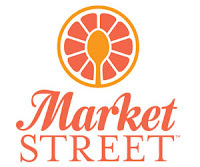 If you live (or visit) in the Dallas, TX, area, be sure to visit a Market Street and try their fresh Sugar Tree fruit in the produce department. You’ll find varieties from white peaches to pluots to peach-a-rines, white nectarines, apple-pears and more. Ask for a taste of these sweet, flavorful fruits, then take some home to try with this dip! I am definitely going to try that! What an easy combination. Thanks Joy! I have made this dip many times. I LOVE IT! I have to be make myself not eat it directly by spoonfuls. Thanks for reminding me. I think I will go whip up some for this weekend. I love fruit dips and this looks creamy and delicious! :-) Hope that you have a great holiday weekend! YUM! I can't wait to try this! Of course, it isn't something you can eat everyday, but I'd love to make it once in a while for my family. Thanks for sharing this recipe, Joy! Pinning! What a great idea that looks delicious Joy! Great photo! Pinned and shared! Cream cheese and marshmallow cream are two things I never would have thought to put together, but now that you have wrote about it, it sounds like such an obvious (and delicious!) thing. I haven't had marshmallow cream in... geez, probably 23 years! This would be so great for a summer BBQ! Thanks for sharing this! Can't wait to try it. This looks so yummy, Joy! I love fruit dips! oh my gosh I can't believe it's that easy to make! I dropped on over from Wake Up Wednesday. I am going to try this! So easy and sounds so delicious! Thanks Joy for sharing with us at Brag About It! I will be featuring this at our next Brag About It link party - Monday at Midnight! Hope to see you there! What a wonderful dip, Joy! I love how you have used it in the layered dessert as well. This dip is the perfect companion to summer fruits. Thank you so much for sharing this lovely recipe with us at the Hearth and Soul hop. Pinning and sharing! Only two ingredients? I have to try this! YUM! What a delicious easy dip! I love the layered version too. Thanks for sharing at What'd You Do This Weekend? I hope you will join us again next Monday! This looks and sounds great! Thanks for linking up and sharing your recipe with us at Funtastic Friday. I hope you join us again this week. I make this dip and it is one of my favorites! I love, love fresh fruit. Especially in the summer. Thanks for sharing with SYC. I can't wait to try this! Thank you so much for linking up at Tasty Tuesday! Your recipe has been pinned to the Tasty Tuesday Pinterest board! Please join us again this week! Looks Yummy Joy!! Thanks for sharing on My 2 Favorite Things on Thursday!! Hope to see you tomorrow! Pinned! Oh good golly this sounds like a dreamy combination. I can't stomach cool whip (which waaaay too many people use in their fruit dip) but I am a sucker for marshmallow cream. YUM!